Students in Dr. Woodworth's studio are encouraged to find their unique musical voice through an emphasis on solid technique and a thorough understanding of historical and theoretical context. Her teaching is centered around the individual student: his/her existing abilities, maturity, learning needs, and ultimate career goals. Emphasis is given to establishing strong fundamental skills, and students work out of the Barret Oboe Method, Hite Foundation Studies for Oboe, and Ferling Studies. 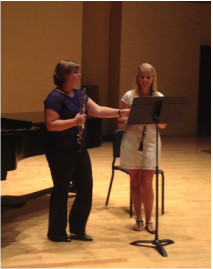 Students are also encouraged to learn and perform solo repertoire, chamber music, and orchestral excerpts. Repertoire is chosen in consultation with the student and varies according to individual and interests and needs. Dr. Woodworth maintains a fair, encouraging, and nurturing environment in her studio while still upholding high standards and expectations. It is her intention to produce self-reliant students who can discover new interpretations, resolve problems in their playing and take on challenges with greater success and self-discipline by developing their self-confidence and their own artistic voice.